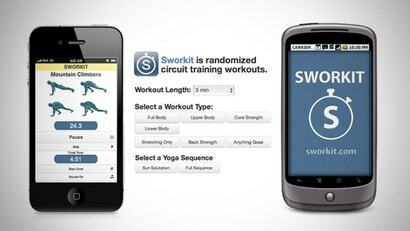 Web/Android/iOS: Sworkit generates random workouts that focus on various parts of the body (or all of it), but it'll work for any timeframe, from five minutes to one hour. You can use Sworkit as a web app, on your Android, or any iOS device. All you do is choose the amount of time you have to exercise, what kind of workout you want, and then do what Sworkit tells you to do. It'll even time each exercise for you so you don't have to bother with a stopwatch. If you don't know how to perform a given exercise, examples will be shown on screen to help you out. With the exception of offering a 20-minute workout — the intervals jump from 15 to 30 for some reason — it's just about everything you'd want out of an exercise app.